A couple of weeks ago, JP Morgan released a report called “CIO Survey Foreshadows Changing of the Guard,” based on a survey of senior IT leaders from large enterprises. The report received a few days of notoriety with, rather unusually, discussion in both the technical and financial press. In our view, a near tripling of the public-Cloud-based workload mix represents a monumental architectural shift, which shows no signs of abating and is likely to create a major ripple effect across the entire technology landscape. I was surprised by how quickly, after a brief period of discussion, everyone seemed to go back to everyday concerns, seemingly unaffected by the report’s message that the world of IT is about to be massively disrupted, with enormous consequences for every industry participant, no matter where he or she works. Bluntly stated, the next five years will lead to an industry that looks very different from today. If one accepts the survey results as given, it’s not inconceivable that one or more of the giants of the industry could end up either bankrupt or merged and shrunk in a forced marriage. Can the survey be trusted? One might, of course, question whether the survey can really be accepted as reflecting the true state of the industry. The survey sample might be skewed, with respondents not representative of the entire population of large enterprise IT shops. Or one might suspect that the questions asked were ambiguous and therefore misinterpreted by respondents. The result would not, therefore, really support the headline conclusions. As to the first question, the survey captured over 200 respondents, with a mean annual IT spend of $600 million. It’s possible, but unlikely, that these 200 were somehow drawn from an unrepresentative portion of the overall enterprise IT population. Even if they do not perfectly reflect the overall population, it is very likely that the workload deployment trend they describe is broadly accurate, with any differences between respondents and total population a question of timing, not direction. Regarding the potential ambiguity of the questions identified as leading to the deployment conclusions, they were posed as “Please estimate what percent of your organization's workloads are currently being run out of a public cloud” and “Five years from now, please estimate what percent of your organization's workloads will be running out of a public cloud?” To me, there doesn’t seem much room for misinterpretation of these questions. 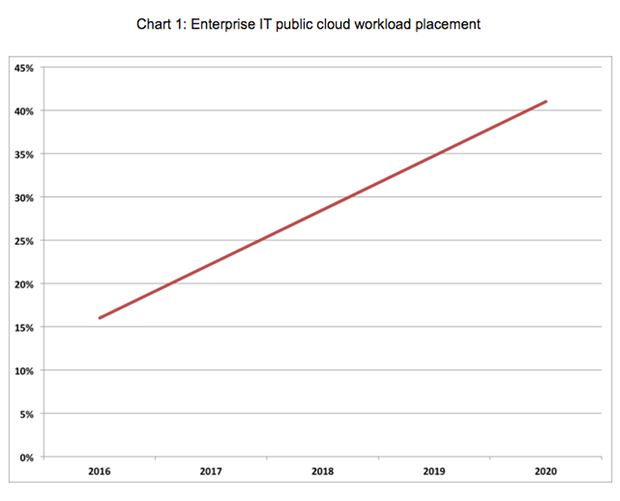 The obvious fact from this survey is that 2020 will see about 250 percent growth of workload placement in public cloud environments (see the chart below). The dramatic slope of the chart tells the story: this is a powerful trend that will unfold quickly and explosively. An interesting question not addressed in the survey is what will happen after 2020. Certainly, given this slope, it would not take long until the vast majority of workloads would run in public cloud environments. Of course, it might be that this period represents a one-time shift of workloads, with a large percentage of the remaining workloads remaining undisturbed on-premise afterwards. However, there’s little basis for a belief that most of the remaining 59 percent of applications can’t also be moved into public cloud environments. For deployed application workloads to reach 41 percent of the application portfolio, enterprise IT organizations will need to devote significant engineering resources; if enterprise IT groups are willing to make the investment to migrate 41 percent of the application portfolio, it’s likely that they’ll continue to invest to move even more of the portfolio later on. 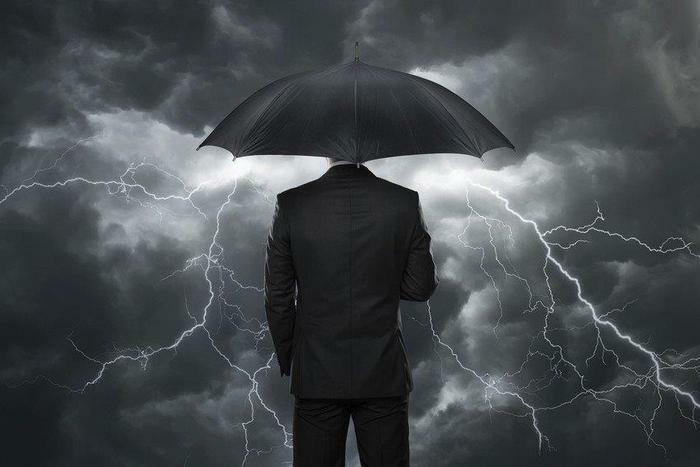 Simply stated, if the advantages of deploying workloads into the cloud are sufficiently attractive to motivate IT groups to accept the disruption associated with the effort, there’s little reason to believe that they won’t continue the exercise and wind down on-premise applications to perhaps 20 percent of the total portfolio. Certainly, there’s no obvious reason why they wouldn’t. Unless one somehow believes that total number of applications within enterprise portfolios will somehow skyrocket, the inescapable implication of the survey is that private data centers are about to be hollowed out. Total required data center capacity will fall 25 percent over the next five years, and, as I just noted, may very well fall further as the public cloud migration continues. With respect to data center economics, this survey of real-world user intentions is interesting, as I continue to encounter people from both customers and vendors who insist that applications can be run less expensively on-premise. This despite evidence that enterprise IT groups have concluded that applications can be run better and cheaper somewhere else. One interesting development that will undoubtedly play out is what happens as data center costs are spread across reduced portfolios of on-premise applications. The overhead of the data center will be assigned to fewer and fewer applications, resulting in larger and larger overhead cost allocations. This will likely accelerate the pace of application migration, as application owners seek to flee ever-increasing cost assignments. Another obvious implication for enterprise IT groups is that demand for infrastructure-oriented skills is going to shrink, with a concomitant increase for application-oriented skills. It’s not going to be a great time to have a skill set focused on data center storage or compute. Employees will face the necessity of needing to retool their job focus toward applications. Employers will struggle with how to obtain enough talent. This will be exacerbated by the pressure on IT from peer business units and senior executives to deliver digital applications more quickly. And both sides will soon come to recognize that building cloud-native applications requires skills quite distinct from traditional three-tier applications. The starkest message of this survey is the bleak future for vendors primarily focused on on-premise markets. As you’ll recall from the quotation at the beginning of this piece, the report’s authors wrote that “a near tripling of the public-Cloud-based workload mix represents a monumental architectural shift.” In my experience, financial analysts typically hedge their statements with words like “potentially,” “perhaps” or “likely.” For the report to use such blunt language implies to me that its authors view this trend as, well, enormous, with repercussions spread across the entire industry. So, if we accept the characterization of the shift to public cloud computing as “enormous,” what does that mean for traditional IT vendors? First off, the survey calls into question the strategy most legacy vendors seem to have fastened on: hybrid. Despite the almost comical ambiguity of a word used as a crutch by vendors to describe their core strategy, as I understand it hybrid means a world in which some applications run in a public cloud environment while others run on-premise. Never stated, but seemingly always implied, is that the portfolio breakdown will end up something like 80 percent on-premises and 20 percent public cloud. Clearly, that’s not the future envisioned by these vendors’ customers. If hybrid doesn’t turn out to leave most application workloads remaining on-premise, what are the financial implications for the industry? Well, we’ve already seen vendors struggling with low- or no-growth over the past several years; we can expect to see the numbers get even worse as the public cloud trend becomes more pronounced. We could conceivably see revenues for some of them drop by anywhere from 20 percent to 50 percent over the next five years. And, just as clearly, this is going to be an increasingly unpleasant market for legacy vendors. If I were working at one, I would be terrified at what the future looks like. We’ve seen what happens when a once-mighty vendor’s market dries up. Let’s review what happened with Digital Equipment Corporation (DEC). A former high-flyer, the company ended up bought by Compaq and then merged into HP, before most of the mess was hived off HP Enterprise as an unattractive low-margin business. Along the way, DEC employees experienced wave after wave of layoffs, cost-cutting, strategy redirection, and termination of research and innovation. I was assured by a friend working at one of the large legacy vendors that its senior executives are well aware of the market reality of the near future and are prepared to succeed in it. That may be, but I have to say that there is little evidence in the current public pronouncements it is giving out. Perhaps it has a secret plan it will spring on the world, but on the face of it, it seems to be no more ready for the upcoming game of vendor musical chairs than its counterparts. I think you have to have an opinion on this survey. Either you think it has procedural shortcomings (e.g., skewed sample set) or you think it reflects a dramatic market shift that will occur in a compressed timeframe. As my comments on the survey methodology indicated, I believe it is broadly accurate, with perhaps some question about the speed of the shift. As to the fact of the shift toward public cloud computing, I don’t see how you dispute it. This survey is the first evidence I’ve seen of the magnitude of the change public cloud computing is forcing on the technology industry. It makes obvious just how powerful is the disruption Amazon unleashed a decade ago. It also makes clear just how different the future of IT will be from its recent past.